Today at school Ryleigh had to pick her favorite book and dress up as a character out of the book. The instructions said that it couldn't be a disney character...to bad because I think we have every Disney costume available! Instead of actually letting her pick the book I went through the books to find one that we would actually be able to dress up as. I found a few and let her pick from those. 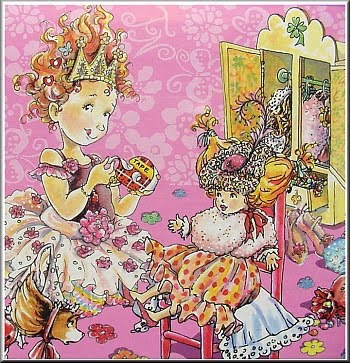 She chose Fancy Nancy. Which if I had to pick I would think actually is her favorite book. It's actually a series of books but we only have one. So this is kinda what she should dress like. 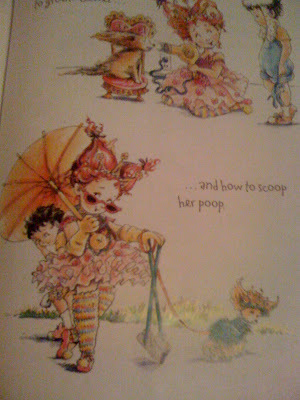 This is a picture I took of the page in the book...The second one is a better picture of Fancy Nancy but not the one we were trying to duplicate. And here is our creation! Notice the crown, pig tails, tights, skirt, dog and sunglasses. I think we did a pretty good job and the best thing is we didn't have to buy anything. She helped pick the whole thing out and is very excited to wear it to school today! She wanted to also take an umbrella like in the picture but I thought Mrs. Parden may get mad if we showed up with to many accessories! Like there is such a thing as to many accessories! How cute! I love your posts and keeping up with the kids. Ry looks so cute and I agree - you can never have too many accessories!